I finally jumped on the chia pudding bandwagon. 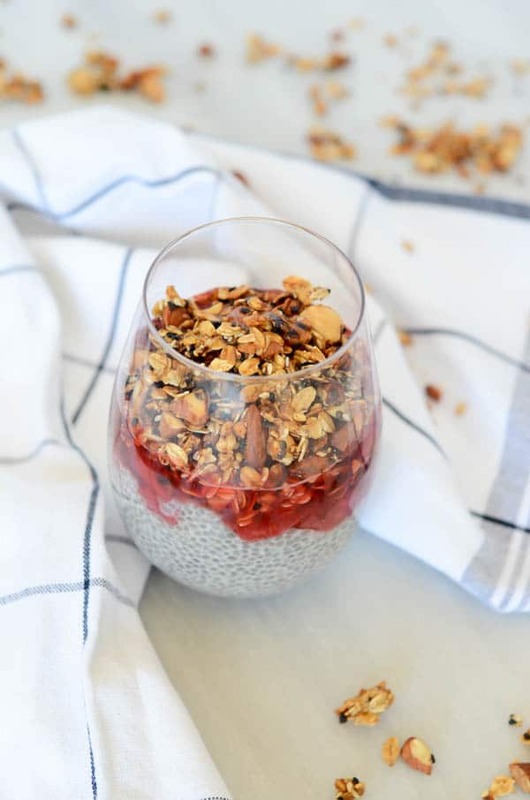 So when I started thinking that I needed to hop on this chia pudding train (because yes, if everyone else decided to jump off a cliff, I probably would too), I started brainstorming ways I could add texture and flavor to make it a truly enjoyable meal for me. I immediately thought of adding some crunch, and what better way to do that than with my absolute favorite, Andy’s Fairfield Granola? It’s got the oats, it’s got the nuts, it’s got the spices and sesame seeds…Perfect-o. The next morning, there’s a chance the chia pudding may still be a bit clumpy. That’s okay! Simply give it another stir and let it sit for 10-20 minutes more (and if you don’t have time, use the pudding as is.) It will continue to firm up the longer it sits. Distribute the pudding among the serving vessels (I used stemless wine glasses), then add the stewed strawberries over top. Finally, sprinkle on the granola. If you’re feeling incredibly ambitious, you could drizzle on some honey to really finish them off. That’s it! Now, I know it’s only Wednesday and you’re looking for that little something to get you through the rest of the week. Guys, this is that thing! 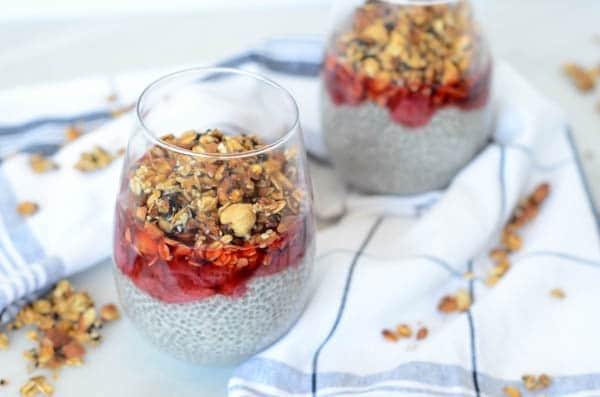 I promise that if you wake up in the morning knowing that this Coconut-Vanilla Chia Pudding Parfait is waiting for you, it will make it sooooo much easier to get your booty out of bed, and maybe to the gym for that AM workout? I don’t know about you, but food is always my best motivator. 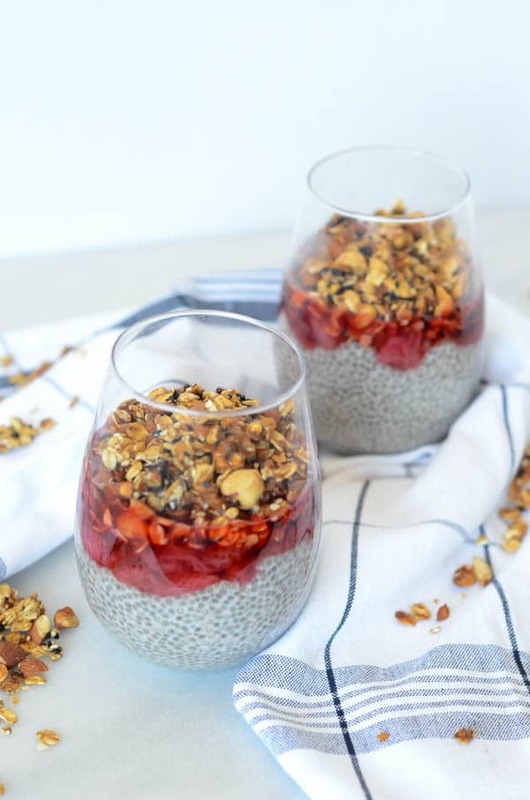 What I am pretty sure of is that Kayla would totally approve of this Coconut-Vanilla Chia Pudding Parfait (okay, maybe minus the booze, but we’re all about balance, right?) I’ve found that it’s the perfect pick-me-up after one of her intense training sessions. It’s got tons of protein to keep me satiated plus loads of vitamins and minerals. So many good things! So tell me, do I have any fellow BBGers out there? How do you feel about the new app? And for all my readers in general, what are your favorite post-workout meals or snacks that leave you feeling replenished and refreshed? I’m going to need lots of healthy, energizing meals over the next few months! 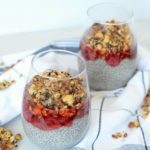 A delicious, healthy chia pudding parfait with crunchy granola and stewed strawberries. One batch of Andy’s Fairfield Granola Note: This will make way more than you actually need, but it’s a great snack to have on hand! First, prepare the granola according to the recipe, found here. Cool and store in an airtight container or resealable bag until ready to use. The night before, prep the stewed strawberries and chia pudding. For the strawberries, combine all ingredients (strawberries, sugar and amaretto) in a medium saucepan. Cook over medium heat until strawberries have released their juices and turned slightly syrupy. Remove from heat and let cool. Once strawberries are mostly cool, place in an airtight container in the refrigerator overnight. 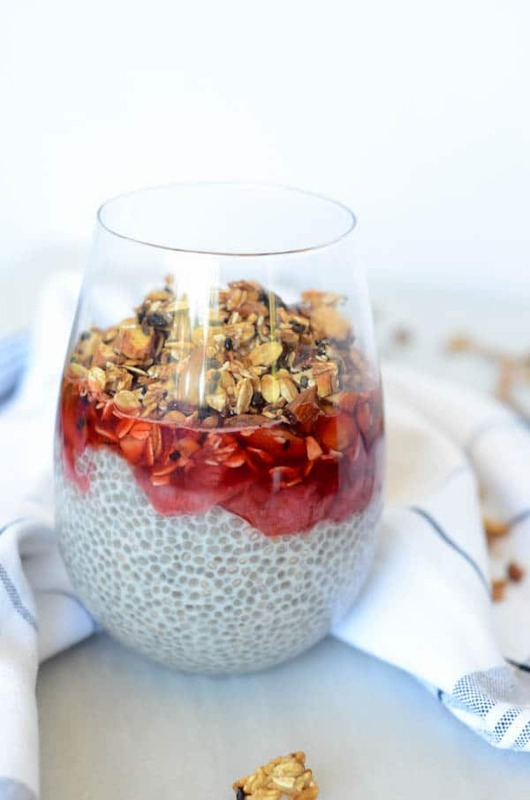 For the chia pudding, whisk together the chia seeds, coconut beverage, vanilla and honey. Let mixture sit for about 10 minutes and then whisk again, breaking up any clumps. Place in another airtight container in the refrigerator. Let sit overnight. Remove the strawberries from the refrigerator and spoon on top of the pudding in the individual glasses. Next, sprinkle on a generous serving of granola (I’d say ¼ - 1/3 of a cup, depending on how indulgent you want to be.) Top with a little drizzle of honey, if desired. 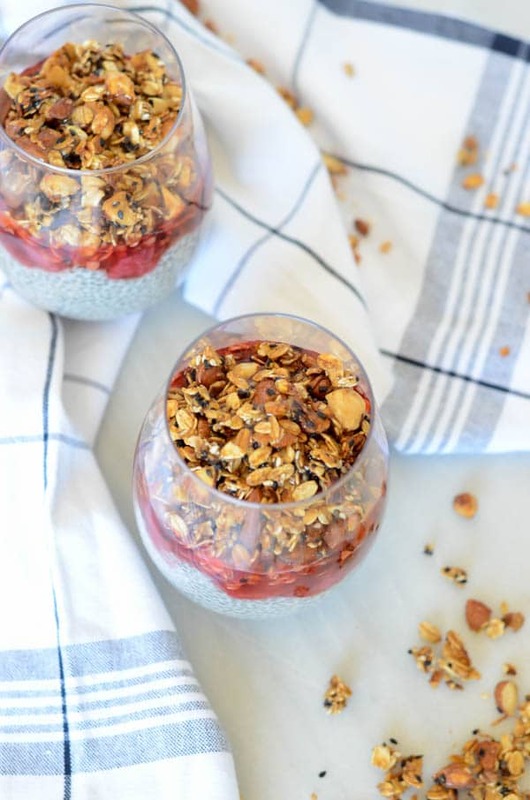 These chia pudding parfaits were delicious on the first morning, but got even better by the second morning. Simply wait to add the granola until right before you're ready to eat so it doesn't get soggy.